A continued decline in the student enrollment and retention and graduation rates of Underrepresented Minorities (URM) in STEM majors is a potential threat to future sustainability, viability, and competiveness of several STEM degree programs, particularly at Historically Black Colleges and Universities (HBCUs). The development of a broad-based and inclusive strategy to motivate, excite, retain, and graduate highly qualified URM students in STEM disciplines is therefore a national priority and is imperative for HBCUs. 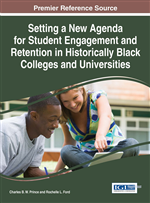 This book chapter highlights four major strategies including: 1) the design and implementation of new curriculum initiatives, active learning pedagogy, and other student engaging pedagogies, 2) early involvement of URM students in hands-on and guided inquiry research experiences in STEM majors, 3) establishing collaborations between HBCUs and Community Colleges, and 4) establishing strong collaborations between HBCUs and local K12 school districts to promote a grass root science education to promote a quality pipeline for HBCUs. Unarguably, several initiatives including, provision of financial aid and scholarships, work-study and research assistantships, supplementary instruction, tutoring, and recitation, in gatekeeper STEM courses, as well as the use of active-learning innovative techniques, have been strategically utilized to address the poor URM students’ performance, low retention and graduation rates at HBCUs. However, this book chapter will only focus, highlight, and discuss four major strategies that can be utilized to improve the overall student enrollment, retention, and graduation rates as well as to promote the success and performance of URM students in STEM at HBCUs. The conceptual framework of the four major initiatives that will be highlighted are: 1) the design and implementation of new curriculum innovations and active learning pedagogies; 2) involvement of URM students in early hands-on guided inquiry research experiences; 3) establishment of mutually beneficial collaborations between HBCUs and Community Colleges (CCs); and 4) partnership with local K12 school districts to promote a grass-root science education pipeline for HBCU STEM majors. A diagram representing the framework for the four initiatives discussed in this chapter is shown in Figure 1. The first subsection of this book chapter will highlight the design and implementation of new curriculum initiatives, active learning pedagogy, and other student engaging pedagogical strategies which have been shown to promote student learning, critical thinking, and problem-solving skills of URM students at HBCUs. Specifically, the implementation of new approaches that incorporate guided inquiry laboratory experiments (GILEs), process oriented guided-inquiry learning (POGIL), Just-in-time teaching, and problem-based research. Herein, we will highlight how these approaches have been integrated throughout the curriculum to involve URM undergraduate students as early as the freshman year. The challenges hindering the implementation of new innovative curriculum pedagogy include: 1) students balking at and unreceptive to new curriculum innovation due to additional responsibility requirements, 2) high instructor teaching workload, 3) concern for negative student and colleague evaluations by junior faculty, 4) budget limitations and/or instrumental constraints, and 5) student team-work group dynamics. The strategies to resolve these challenges to promote a wide scope utility and implementation of active learning and new curriculum innovation pedagogy in STEM will be discussed.